I DID it finally! 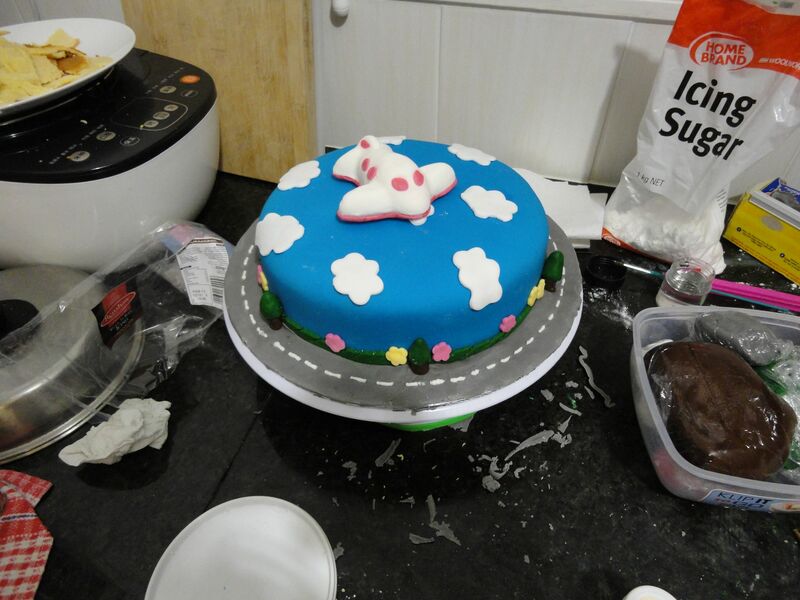 This is my first proper fondant cake. Although it wasn’t perfect but I was pretty happy about it. It took weeks from planning and execution. I even wrote down a schedule of the preparation a week before the birthday. 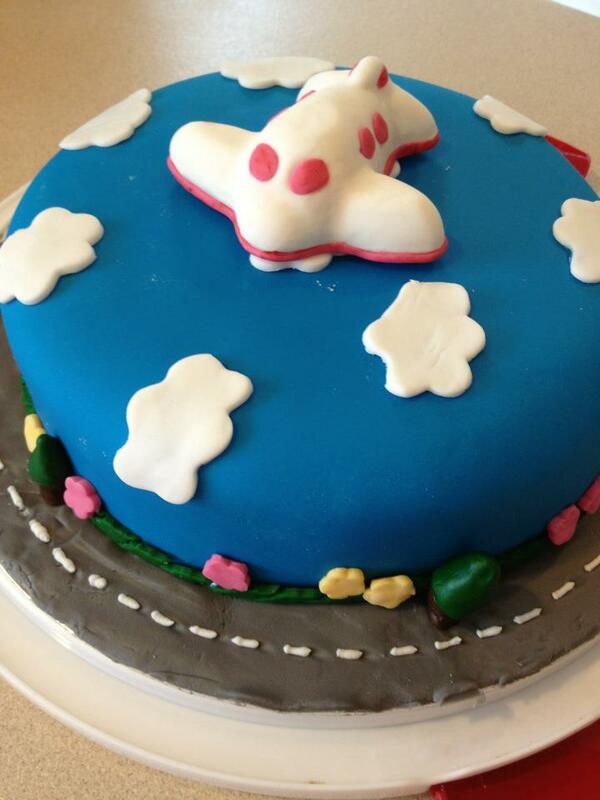 My first fondant experience on a 9’in cake(previously on small cakes/cupcakes) wasn’t easy. It took me three attempts to roll out the fondant and cover the cake. I used the shortening to grease the work surface for the first two attempts, and I rolled out the fondant quite thin, therefore I couldn’t lift the fondant without tearing it. At the third attempt, I used the cornflour to dust the work surface instead and kept the fondant quite thick, then I could lift it and move it over to the cake. However the downside of using cornflour was the fondant got dried out easily. I managed to make a hold on the fondant when covering the cake. Luckily it was at the bottom of the cake, it could be easily covered by my design – using the green fondant as the grass. Talking about fondant, the Satin Ice fondant was easy to work with. I used the blue one to cover the whole cake. The white Pettinice fondant smelled nice and was easy to work with too. I used it to make the cloud and the airplane. Also I coloured it myself to make the flowers. But the colored Pettinice fondant was super sticky! I bought the green one and intented to cut out the mountain or the grass shape but I couldn’t get it off my hand or the work surface, neither it could hold the shape of my design. I had to add a lot of icing sugar and cornflour, and eventually I just used the roller cutter to cut out some sort of long strips as grass. The Regal Ice fondant has lots of different colours with small package size. The consistency was great for modelling and make small decorating pieces. I used the brown one to make the tree chunks, and the grey one to make the road.